Marley DVD Review MacDonald’s contention that prior to the present undertaking ‘nothing good has really been made in terms of a documentary about Bob’ is a little unfair - Bob Marley: Rebel Music springs to mind as a worthy contender, and even trumps Marley in regards to studio footage and interviews with Bob’s wife Rita - yet this film still stands as a thrilling and inspiring exploration of one of recorded music’s last true immortals. Many years in the making and produced with the full cooperation of Marley’s family members, a number of whom appear as interview subjects herein, Marley was helmed by Kevin McDonald, the Academy Award-winning director of The Last King of Scotland and State of Play. He brings a deft touch to proceedings and the end result is both an impeccably edited and superbly rich complement to the poet-prophet whose work continues to inspire millions of people the world over. Covering Marley’s turbulent upbringing in Jamaica’s Trench Town, his early years with the Wailers and eventual breakthrough to the mainstream a decade later, to the years of rabid superstardom, innumerable love affairs, the rise to the status of icon and his eventual untimely death from cancer at the age of 36 - Marley charts the songwriter’s entire journey with an unflinching though not unaffectionate candour, complemented throughout by a wealth of well-chosen and frequently rare interview, concert and behind the scenes footage. 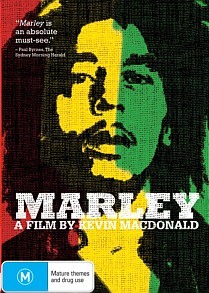 MacDonald has a clear reverence for his subject, yet the end result is far from unthinkingly partisan: rather the goal from the beginning of the project was to paint a rounded portrait of Marley as a man, not simply as the near-deified musician-prophet he later became, and in this aspect and many others the film is an unqualified success. MacDonald’s contention that prior to the present undertaking ‘nothing good has really been made in terms of a documentary about Bob’ is a little unfair - Bob Marley: Rebel Music springs to mind as a worthy contender, and even trumps Marley in regards to studio footage and interviews with Bob’s wife Rita - yet this film still stands as a thrilling and inspiring exploration of one of recorded music’s last true immortals. A 12-minute interview with director Kevin McDonald.